John Sutherland, crofter of Achnigoul, died 7th July 1902 aged 90. 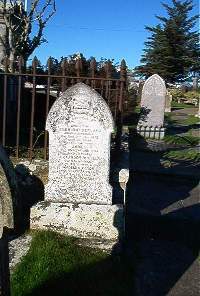 Son James Sutherland died 24th November 1888 aged 33. Son Alexander William Sutherland died in infancy. Wife Isabella Olson died 28th April 1912 aged 88. Daughter Johan Sutherland died 15th Febuary 1932 aged 83.